If you have unique, legitimate insights that shed light on an opportunity, don’t let inexperience in that industry alone be a reason to stop you; move boldly forward. Hope, trust, and opportunity aren’t words I would naturally associate with Mogadishu, Somalia. 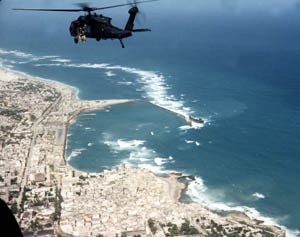 Known to many Americans as the site of Black Hawk Down and to many others as one of the most dangerous cities in the world, all I knew of the place were transmutations from pop culture and 24 hour news channels. So it was pretty eye-opening to run into the current mayor of Mogadishu, Mohamoud Ahmed Nur, in Switzerland earlier this month (Quite literally. He was dashing into the reception for an event I was attending. A friend I was with pulled us right into his path. Yes, unfortunately I can’t claim credit for recognizing him myself). I asked Nur how he was doing. Tired. He had just criss-crossed across 4 or 5 different African nations with the same message he was about to tell this new audience in Switzerland. But as he spoke, his eyes lit up and his voice gushed. He told of hope, trust, and opportunity–including entrepreneurial opportunity–in this forsaken land. I think all of us, including here in Silicon Valley, could take inspiration from the ongoing transformations occurring in Mogadishu and what it means for us. Nur had himself once written off his native city, choosing to reside in London and refusing not once but twice in a row when tapped by the President of the transitional government to take the helm of the city. The third time, in 2010, he gave in. He realized in a spark of insight that while the local people had descended into darkness, what he called a box of darkness, as a relative outsider he possessed the ability to create a window of light, of hope, the start of new foundations for renewed opportunities in Mogadishu. Three years and countless death threats and assassination attempts later, light is indeed coming to Mogadishu–Nur shared that today the once-dark streets are now lined with solar powered lights. People are buying and selling goods and services using their mobile phones as a means of transmitting and receiving funds. The garbage piles that used to line the streets (and which gangs would charge international aid workers a fee to remove) are gone. The land is ready to be put to work, with rich soil for agriculture, abundant metals and minerals useful to industry, and even beautiful beaches and coral reefs awaiting tourists. What does this mean to us, thousands of miles away in our relative stability and comfort? There’s more than one take-away from Nur’s story, but I’ll save that for a future post (such as the greenfield opportunity for entrepreneurs who dare to take on 90% of the world’s problems, and to look beyond the 10% echo chamber we tend to read and talk about most of the time). For now, I’ll just point to the fact that it was in part Nur’s status as a relative outsider that allowed him to see the same present as everyone else, to envision an alternative version of the future than the ones that most in Mogadishu saw, and then make that vision become reality. Call it naive optimism even, but it was the perspective of Nur and others like him that helped hope, trust, and opportunity take hold where most had written such progress off as impossible. I can’t help but think of the boldness of many entrepreneurs when reflecting on the above. It takes a lot of boldness and confidence to take on a new idea. It takes even more to do so when you technically have no experience in the industry you’re seeking to disrupt. Yet time and again, such founders have seen success. Fred Smith penned the plan for FedEx while an undergraduate at Yale. The founders of Airbnb had never run a hotel or acted as apartment landlords before. And it’d be hard to imagine the Facebook founding story if the founding team had been former employees of MySpace or Friendster instead of college roommates. In all the above cases, being an outsider alone was not enough. Each person had unique insights that gave them a leg up on anyone else attacking the same problem. Although he had lived away from Mogadishu for years and years, Nur saw what worked in London, including the regeneration of Kings Cross. Fred Smith had been an amateur pilot while growing up, and thus could understand the potential of airplanes on logistics when combined with the power of computers. The founders of Airbnb started renting out part of their apartment because they couldn’t afford to pay rent on their own. And Mark Zuckerberg had been observing his friends using AOL Instant Messenger to check their friends’ profiles, as well as the success of his hack on the official Harvard facebook directory, Facemash. Some of the founders of startups in the FundersClub portfolio were newcomers to their industries too prior to founding their companies, yet have gone on to see great success. Jessica Mah of inDinero comes to mind, who took on the entire accounting industry despite not having an accounting background at the outset of her journey (she’s now licensed by the Internal Revenue Service to prepare tax returns and represent taxpayers before the IRS, and she employs a full team of tax and accounting experts). If you have unique, legitimate insights that shed light on an opportunity, don’t let inexperience in that industry alone be a reason to stop you; move boldly forward. The perspective of people entrenched in the industry might very well be blinding them to the opportunity that you see. Surround yourself with the right people to make up for your lack of industry insights if needed, but don’t let lack of industry experience alone be a reason to abandon ship.